Safe, easy, and fun to fly, the X101C quadcopter makes it possible for everyone to reach for the sky. 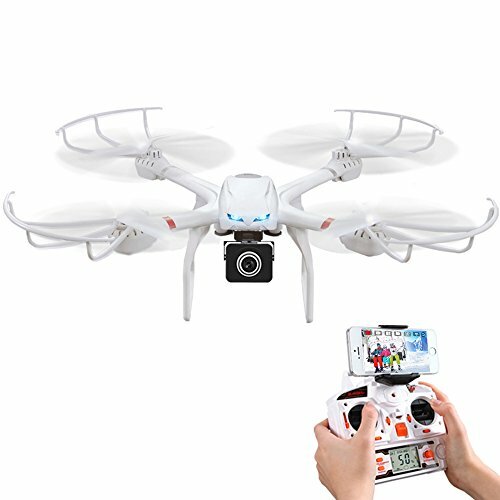 With Headless Mode, there is no need to adjust the position of quadcopter before flying. The direction will be the same as your transmitter. The wifi signal records your quadcopter’s takeoff point and remembers it as you fly. Then at your command, your quadcopter will vertical return along the direction of the transmitter under the headless mode. See exactly what your camera sees with a live video feed right on your mobile device. The X101C gives you an all new perspective of sports, parties, and family events with a built-in camera that captures sharp, vivid 720P video and 1 megapixel photos.